View of “The Gravity of Things,” 2013. Gravity acts as an organizing principle in this exhibition of four works curated by Chris Sharp. Take Viola Yeşiltaç’s photograph Mise-en-scène, Untitled (I Really Must Congratulate You on Your Attention to Detail), 2012, which wages a nearly impossible situation: two pieces of paper caught leaning against each other, staging a moment of delicate equilibrium. Echoing this is Fernando Ortega’s photographic diptych Short Cut I and II, 2010, which depicts two leaves held together by a safety pin; an ant walks across the slender needle as if it were a bridge. Sara Barker’s Nature—Builder, 2012, plays with the gravitational dynamics of a line drawing: Four metal rods make a diaphanous sculpture that hovers over a plaque of mirror. The spare is a demand for attention, pulling attention to moments of magic. 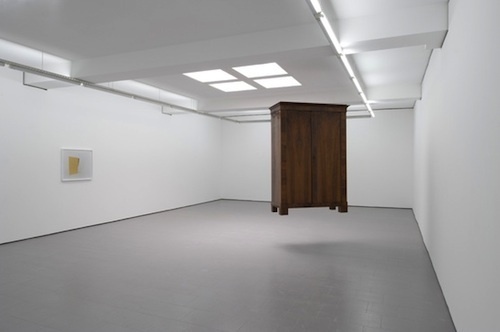 Mandla Reuter’s The Agreement, 2011, is a large armoire that has been suspended from the ceiling by yellow straps, the sort normally used to secure objects in transport vans. The artist has requested that no photographs be taken as he wants to control the digital documentation of the work. The Agreement thus has two lives: one within the space and timeframe of the exhibition and then another as an image that Reuter will digitally manipulate, erasing the straps to present a free-floating bulky armoire. If the schism between the weighted and weightless charges “The Gravity of Things,” Sharp nods to the virtual as the most ubiquitous of nongravitational fields.